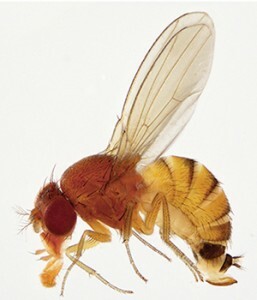 Brief: A single Spotted Wing Drosophila (SWD) female was observed in traps placed in near ripened red raspberry planting in the Hudson Valley by Jim O’Connel of UC-CCE and checked on June 21th, 2018. The find in a commercial berry in Gardiner, Ulster County is the second find for the season in the Hudson Valley. In a 25 fruit sample no eggs were detected. SWD numbers from traps remain low across Cornell Cooperative Extension SWD trap network trapping locations. Raspberry, blackberry, sweet and tart cherry, strawberry and blueberry are very susceptible to SWD as populations build over the coming weeks. 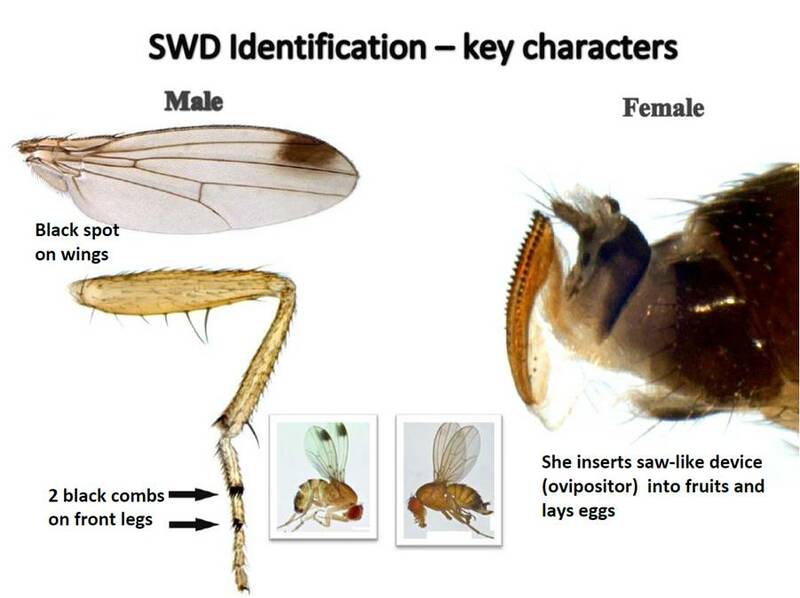 Set traps this week to monitor for movement of SWD flies into ripening fruit of susceptible crops. 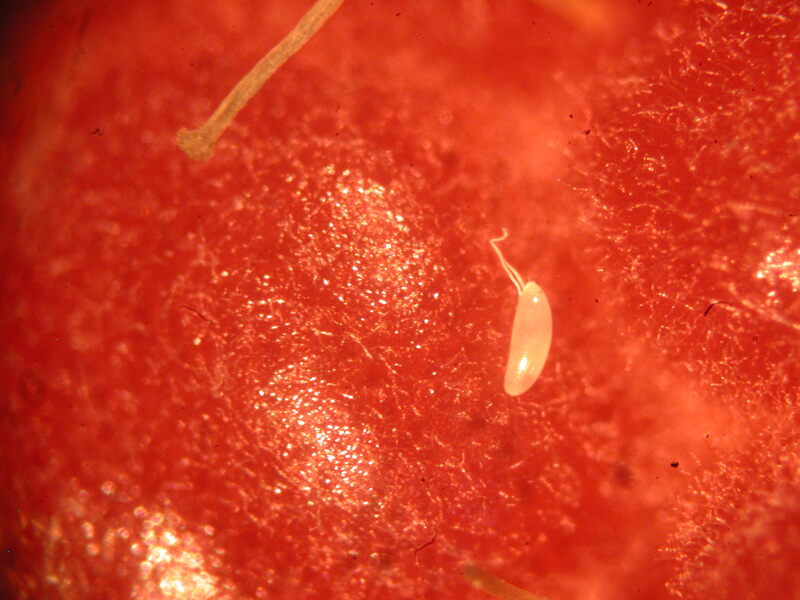 Management should begin when SWD adults are found in commercial orchard or when eggs first appear in fruit. 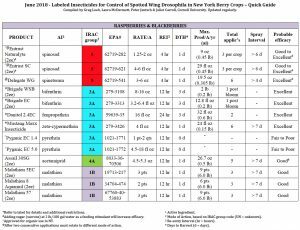 Management Details: There are only three effective classes of insecticides labeled for use to manage spotted wing drosophila on sweet cherry. They include the pyrethroids (IRAC Class 3): Asana XL 0.66EC (esfenvalarate) and Lambda-Cy 1EC (lambda-cyhalothrin); and the Spinosad class: Delegate 25WG (spinetoram) and Entrust 2SC and 80WP (spinosad); and the Diamide (IRAC 28) Exirel. 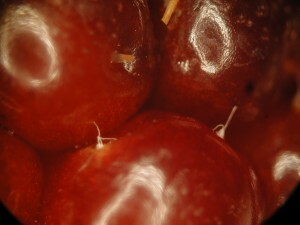 The organophosphate (IRAC Class 1): Imidan 70W (Phosmet) can only be used on tart cherry.